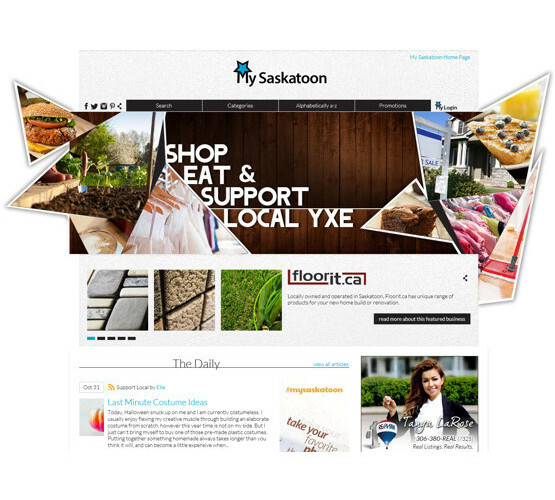 My Saskatoon gives your business a hub where you can showcase everything you are doing online in one place, and present all of your information to consumers that love to support local businesses. We call this hub a "Spotlight Profile", and with this tool all of your blogging and social media efforts are displayed to your clients in one online location. The community of consumers that use and support My Saskatoon is continually increasing, giving added value and traffic to your online presence. With every Website Hosting Package, we include a discount of over 60% off of the regular price of a Spotlight Profile on My Saskatoon for 1 year. This is a fantastic way to help launch a new or redesigned website! Combine a new website or a redesigned website with a Spotlight Profile from My Saskatoon, and you will having a winning combination when you launch your new website. If you would like to get a quote on a hosting package or website design combined with a package from My Saskatoon, please send us a quote request using the link below. 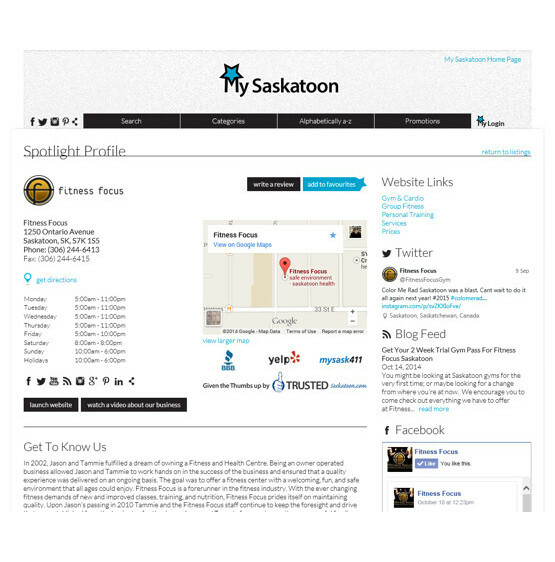 Each business on the My Saskatoon platform receives what we call a "Spotlight Profile", this page allows you to feature everything you are currently doing online in one cohesive location. The spotlight profile page allows you to display your Twitter feed, Facebook feed, blog posts, Instagram feed, Flickr feed and Youtube channel among many other things as well. Your Spotlight Profile automatically updates as you publish content to any of your social media channels. We have also provided a management tool so that you can modify any of the information on your Spotlight Profile as required. Your Spotlight Profile page provides valuable links to your website to help direct consumers to the most important sections of your website, it also gives you an advantage in terms of Search Engine Optimization for your own website. Another key component of the Spotlight Profile is the "Reputation Management" component in the administrative tools. The Reputation Management tools show you what is being said about your business across the Internet and on social media websites. This feature allows you to address any concerns that may arise that affect your online reputation. These tools also provide a snapshot of how you are stacking up against your competition in the search engine rankings. Not only does a Spotlight Profile help you present your business effectively to your clients, but the reputation management component also helps you manage what others are saying about you online. My Saskatoon also offers a product that gives your business some excellent exposure, this product is called the "Featured Business" package. The Featured Business package includes a professional photo session of your business, and an article written by a member of the My Saskatoon team about your business. 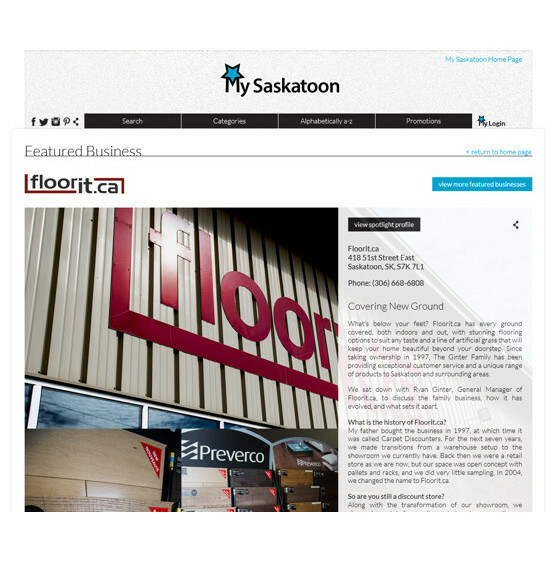 Together the photos and the article are used to create a web page that showcases your business on the My Saskatoon website. This article is featured on the My Saskatoon home page directly below the main banner, and once it moves off of the home page it stays in the featured business archives, this way people will always be able to read an article about your business on My Saskatoon.